We have landed in Mexico for the month of October! Our trip around the world is nearing an end, it is hard to believe. Exploring the food and culture of Mexico was pretty easy for us. We love Mexican food. In fact, you will find our recipe for crock pot beef tacos right here. This month presented us with a great opportunity to not only look at the typical Mexican food we enjoy, but to find out more about Halloween in Mexico. When you think of Mexico at Halloween time you probably think of dia de los Muertos, the Day of the Dead. This holiday takes place between October 30th and November 2nd. Dia de los Muertos is an opportunity for families to gather, remember and commemorate those who have passed away. The festivities include making gifts and enjoying the deceased persons favourite foods. Really, it sounds like a family reunion where you chat, laugh, reminisce and celebrate family members who have died. 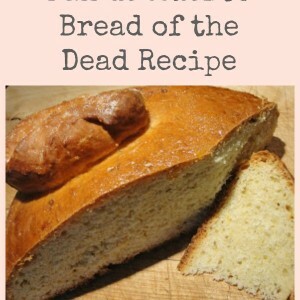 Aside from the enjoying the favourite foods of those who have died, it is also tradition to make pan de muertos, bread of the dead. We have never made a yeast bread before. We’ve made many different types of loaves and quick breads…this seemed like the perfect opportunity to try out a yeast bread. We searched out a recipe and got to work. 1. In a small saucepan, heat milk and butter over medium heat. 2. Remove from heat once the butter has melted, add the warm water…the mixture should be about 110F. 3. In a large bowl combine 1/2 cup flour, yeast, salt, anise seed, 1/4 cup sugar. 5. Once combined, add beaten eggs and orange zest. 6. 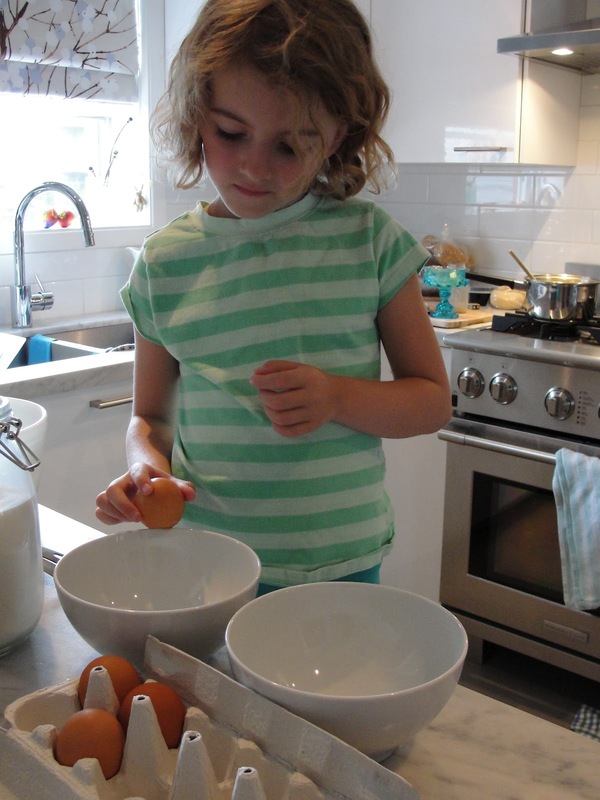 Add 1/2 cup of flour and continue adding flour until dough has formed and is soft. 7. Place dough on lightly floured surface and knead until smooth. 8. Lightly grease a large bowl with olive oil, place the ball of dough inside greased bowl…cover with plastic wrap and place in a warm, dry spot until dough has doubled in size…about 1 hour. 9. After 1 hour, punch down ball of dough and place ball on a parchment lined baking sheet. 10. Cut away a few pieces that can be shaped into bones and place on top of ball of dough. 11. Once decorated, cover with plastic wrap and allow to rise again for another hour. 12. After the second rise, remove the plastic wrap and place in a 350F oven for about 35-45 minutes…until golden brown. 13. To make glaze; combine orange juice, 1/4 sugar and zest in a small sauce pan…bring to boil…brush over top of the still warm bread…sprinkle with 2 tbsp sugar. Yeast bread is a bit of a science experiment. How amazing was it for my daughter to watch the bread double in size! 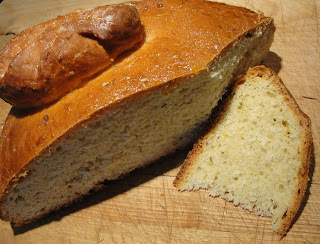 By far her favourite part of making this bread was using the pieces of dough to make bones. It is always fun to play with your food! When it was time to taste the bread, we sliced the bread and spread on some butter. Our bread was enjoyed with a cup of tea. We toasted a glass of tea in celebration and in memory of my mother, who passed away just over 3 years ago. This was a lovely way to enjoy some time baking with my child and reminisce about my mom.Please take some time to check out what all the Around the World in 12 Dishes co-hosts have discovered about Mexico. 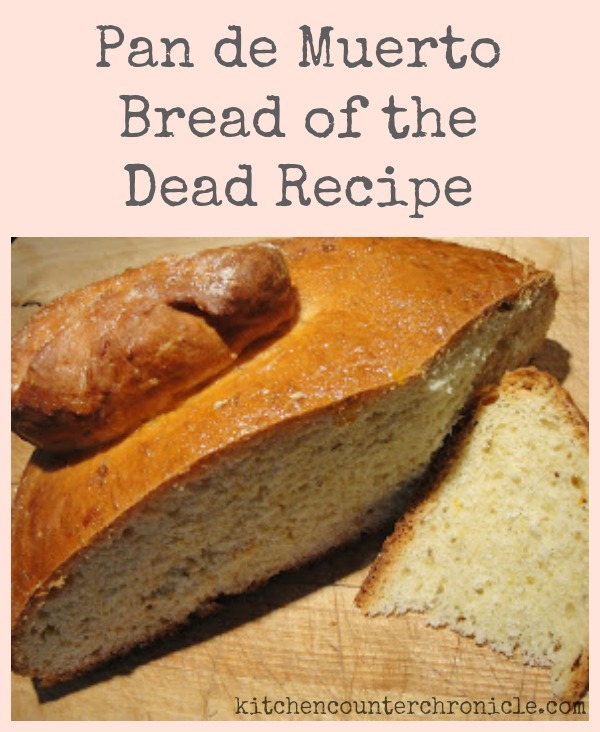 Day of the Dead isn't only about face painting, this recipe for the traditional Pan de Muerto is another part of this celebration. In a small saucepan, heat milk and butter over medium heat. Remove from heat once the butter has melted, add the warm water…the mixture should be about 110F. In a large bowl combine 1/2 cup flour, yeast, salt, anise seed, 1/4 cup sugar. Add 1/2 cup of flour and continue adding flour until dough has formed and is soft. Lightly grease a large bowl with olive oil, place the ball of dough inside greased bowl…cover with plastic wrap and place in a warm, dry spot until dough has doubled in size…about 1 hour. After 1 hour, punch down ball of dough and place ball on a parchment lined baking sheet.